If you are tasked with bringing an appetizer to your holiday dinner or cocktail party, look no further. 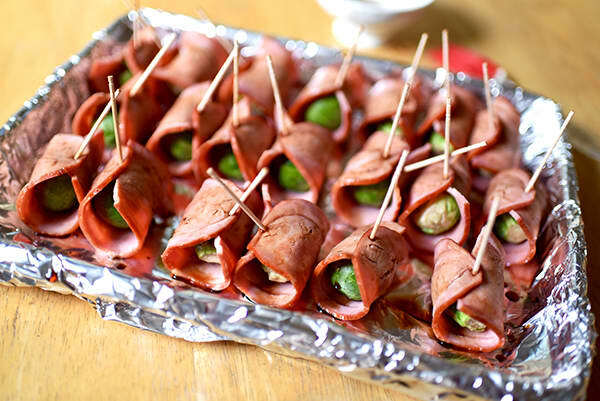 These Maple and Turkey Bacon-Wrapped Brussels Sprouts are savory little bites that will disappear fast. 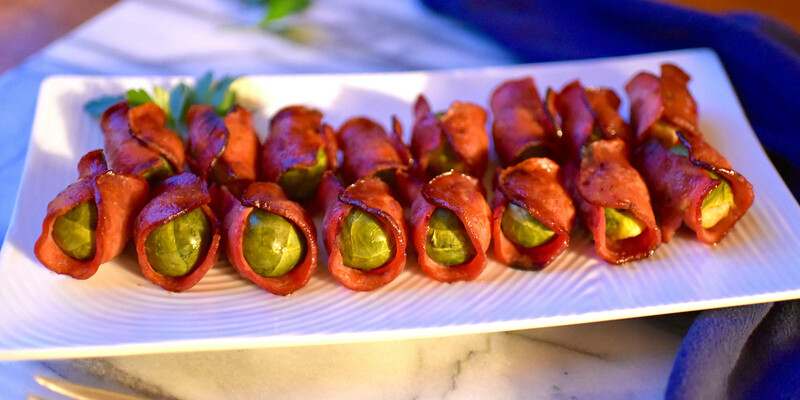 Brussels sprouts lovers will be gaga for them, and even people who are squeamish about the tiny cabbages will want to devour them when they’re hugged by a slice of turkey bacon that’s been painted with a maple and balsamic glaze. It may look time-consuming to wrap each Brussels sprout in bacon — and your friends and family will certainly be impressed with your effort — but these bundles are surprisingly simple to prep. Cut the whole stack of turkey bacon in half, then start wrapping. The trick is to look for sprouts that are on the smaller side so that half a slice of turkey bacon can easily reach around the circumference and be secured in place with a toothpick. If you find that your Brussels sprouts are too large for that, just cut them in half and reduce the baking time. We thought of these Maple and Turkey Bacon-Wrapped Brussels Sprouts, that come out of the oven with a toothpick already inserted for easy grabbing, as the perfect passed-app for holiday parties, but they can also be the star of your weeknight dinner, served with mashed sweet potatoes. 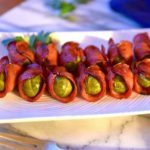 Crisp turkey bacon, crunchy Brussels sprouts, and a touch of maple syrup make these Maple Turkey Bacon-wrapped Brussels Sprouts an instant classic. Line large baking sheet with foil. Set aside. Combine maple syrup and vinegar in a small bowl; mix well. Set aside. Wrap each brussels sprout tightly with half slice of bacon. Secure with a toothpick. Arrange brussels sprouts on prepared baking sheet so that they are not touching. Brush bacon with maple syrup mixture. Sprinkle with pepper. Bake for 30 to 35 minutes, or until brussels sprouts are tender crisp and bacon is crisp.